Famed for having a strong bond with its humans, a Scottish Skye Terrier is a highly person-orientated dog and makes a good family pet, often watching over children and adults when out of the house. It can be very sensitive to its human’s moods and will offer affection and comic relief in times of sadness or difficulty. Although initially wary of strangers, the Scottish Skye Terrier is a friendly dog. Once the first meeting is over, he will welcome new friends with enthusiasm. He is an energetic dog that just loves to run. He is at home in the countryside with open fields and woodland but is easily managed in urban areas so long as a good walk is provided daily. He enjoys a play. But being strong-willed Terriers, play must be managed by the humans to ensure that both human and dog get the best out of all the games. The Scottish Skye Terrier is an intelligent dog with a great capacity to learn. Like all terriers, he can be stubborn. But he enjoys the interaction that comes with training and responds well to a kind but firm handler. A Scottish Skye Terrier puppy is a blank slate when it comes to training and can easily be transformed into a show-stopping breed exhibit, a paw-perfect obedience champion, or a well-behaved and sociable pet dog with a little time and effort from its humans. 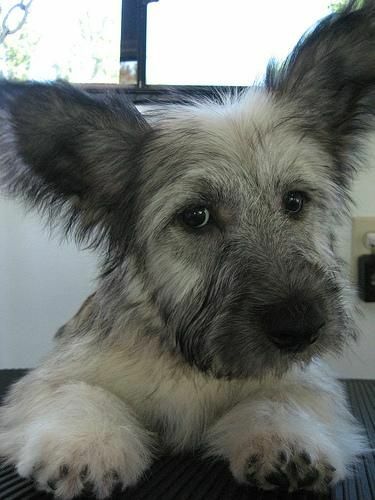 Being a heavily coated breed, the Scottish Skye Terrier needs regular grooming. He enjoys being groomed because it makes him feel pampered and close to his owners. Like all dogs, he must be introduced to grooming brushes and combs at an early age to get him used to the sensation. The Scottish Skye Terrier likes to be the center of attention. What Price are Scottish Skye Terrier Puppies? The price of Scottish Skye Terrier puppies is between $700 and $900. How to Find Reputable Scottish Skye Terrier Breeders? Reputable breeders do not breed to make money. If they produce a litter for a ridiculous reason, that’s something that you need to be wary of. Reputable breeders also belong to a local or a national breed club and are active in showing or training their dogs. They are willing and eager to spend time with you, explaining, teaching, and advising you about their breed. They will clearly explain the advantages and disadvantages of owning the breed. No breed is perfect for everyone, and the responsible breeder wants to be absolutely sure that you really want and are prepared to care for this kind of dog. Reputable breeders will examine you closely to determine your suitability for owning their dog. They will not sell a large, active dog to an apartment dweller, or to someone without a fence, nor a tiny toy dog to a home with small children. Their dogs are screened and tested for genetic deficiencies. Most require that the dog be returned to them if your situation changes and you can no longer care for the dog. Reputable breeders stay in touch with you to see how you’re getting on with your new dog. They do not just sell you the dog and then disappear, leaving you to cope with problems on your own. This is probably the greatest advantage to buying your dog from a responsible breeder. You not only get a healthy, well-adjusted companion, you also get a lifetime of information, advice, and assistance from an expert who cares deeply about you and the dog. The name Scottish Skye Terrier comes from the Isle of Skye, the largest island in the Inner Hebrides near the Scotland shore. According to stories, a ship was shipwrecked near the island with only a Maltese dog for a survivor. When the dog reached the shore, it was taken in and raised by the natives. After several cross breedings with the Dandie Dinmont Terrier and the Scottish Terrier, the present-day specimens were obtained. Scottish Skye Terriers enjoy getting out and being active several times a day. The Scottish Skye Terrier is a small and short dog, with a body twice as long as its height, but brawny. The head is strong and proportional to the body. It has a black nose, and it is covered with a silky forelock falling over its eyes. The eyes are small, round, and hazel. He has pointed and erect ears that are covered by rich and long hair. The tail is docked short and carried straight. It has a double-layered fur, with a thick, soft, and fluffy inner layer. The outer layer is rich, glossy, silky, smooth, and straight, and falls on both sides of the body. 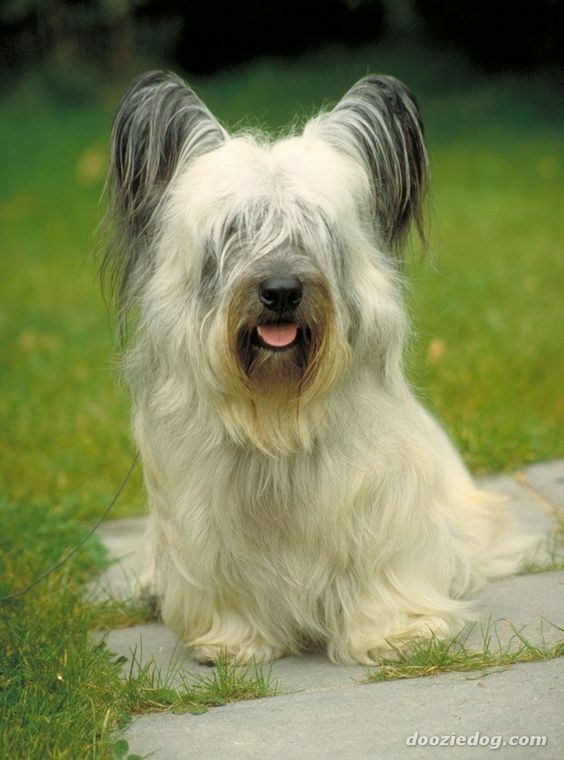 The Scottish Skye Terrier can be cream, yellowish, brown, grey, or black. It has a dark muzzle, dark ears, and dark tail tips. The fur should be brushed or combed weekly to keep it in good condition. The hair has a parting along the back. Excess hair in the ears and between the footpads should also be removed. How Big is a Full-Grown Scottish Skye Terrier? Male Scottish Skye Terriers stand at 20 to 25 inches tall and weigh 11 to 18 lbs. Females stand at 19 to 23 inches tall and weigh 10 to 17 lbs. What is the Life Expectancy of the Scottish Skye Terrier? The life expectancy of the Scottish Skye Terrier is 12 to 14 years. The Scottish Skye Terrier is a brave and active dog outdoors but calm and quiet indoors. He is serious and intelligent. He is loyal to the family and attached especially to one person. He is very accepting of children, especially if they are not teasing him. If he is socialized from an early age, he will have no problems with other animals and with other dogs when he grows up. The Scottish Skye Terrier is generally reserved with strangers, something that makes him an excellent watchdog. He is brave, good-natured, and loyal to his own family. The Scottish Skye Terrier can be described as steady, skilled, astute, and prudent. He’s sensitive but not submissive. He has a mind of his own. This dog has a very good memory and will remember slights or mistreatment. Scottish Skye Terriers like to be part of the family and will become unhappy, bored, and willful if neglected. The Scottish Skye Terrier is an intelligent dog with a great capacity to learn. If you get a Scottish Skye Terrier puppy from a breeder, they would give you a feeding schedule. It’s important to stick to feeding the same puppy food to prevent tummy upsets. You can change their diet, but this needs to be done very gradually to avoid any digestive upsets. It’s best to put them back on their original diet and discuss things with the vet before changing it again. Older dogs are not fussy eaters, but this does not mean they can be given just anything to eat. It’s best to feed a mature dog twice a day, once in the morning, and then again in the evening. It’s also important that they be given the right amount of exercise so that they burn off any excess calories. How Much Exercise Does a Scottish Skye Terrier Need? This dog keeps himself busy, especially if he has a yard to patrol and protect. It’s a job that he takes very seriously. But they will still need a daily walk, which will be a good exercise in socializing this bold and independent dog. If you are looking for a dog to jog with, this is not the dog for you because its legs can tire easily. Likewise, he is not good in the water as his short legs can be a disadvantage. He is known to sink and almost drown in deep water. Keep water levels low to prevent a tragedy. These dogs love to play with children but need to be supervised. Children should also be taught not to prod or hurt him as he will retaliate with a warning nip or two. Games that challenge your dog’s intellect should also be fun, while their training needs to be based on mutual respect. 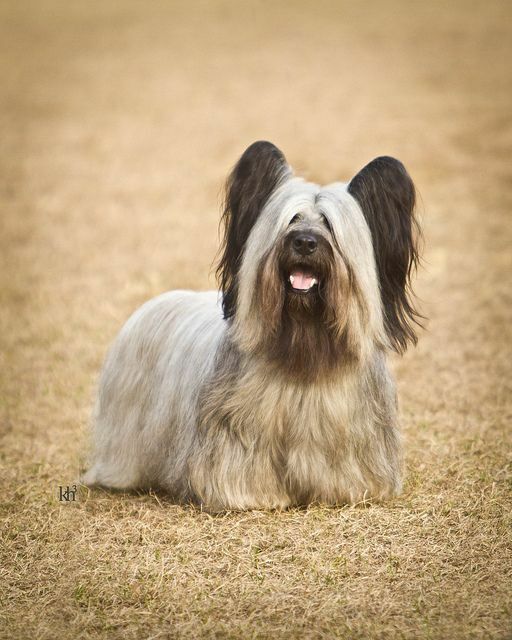 Breed health concerns for the Scottish Skye Terrier may include renal dysplasia, ectopic ureters, hypochondroplasia, glaucoma, foramen magnum dysplasia, chronic hepatitis, back problems, and the Skye limp. Scottish Skye Terriers like to be the center of attention. He will do everything to get that attention, including getting in all sorts of mischief. They are laidback when indoors, happy to curl up on the first available lap for an afternoon of rest and relaxation. But they enjoy getting out and being active several times a day. They are enthusiastic chasers and will run after anything that moves, no matter how small or big. These little dogs are fearless in the face of danger. They have minds of their own and don’t like to be told what to do. But they are sweet, loving, and loyal dogs who adore their family and make terrific companion animals.